Karun Nair has not featured in a International game since the 4th Test between India and Australia in 2017. After scoring a triple century for the country, which has been quite a rare achievement in Indian cricket, Karun Nair has failed to live up the expectations and eventually was shown the exit door. Although there were some doubts raised regarding his omission, one cannot disregard a fact that the decision was taken only for team’s betterment. He has not had the most memorable of outings in the ongoing Ranji Trophy season for Karnataka as well, which adds to his misery. Karnataka are on the brink of elimination after a see-saw battle against Saurashtra at the Chinnaswamy stadium finally tilted in a telling direction, towards the visiting side. 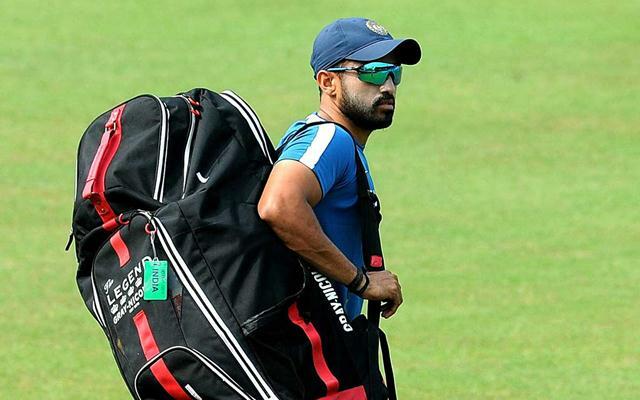 Talking about his present situation with the Indian side, Karun Nair reckoned it is important for him to keep working hard and not think too much about the rest. He also stated that no one did anything wrong to keep him away from the team and urged that he should do better to stay in contention. “I don’t think anything has gone wrong. I think I should do better. I am obviously not happy with results. I am putting in the hard work, following the process and preparing well. Once I get another start, hopefully I can make it into a big one,” he said as quoted in Sportstar. Ever since his retirement, Rahul Dravid has been like a godfather to many young budding cricketers. He keeps in touch with most of the second-fiddle cricketers in the side and motivates them to do better. It was him who motivated the 26-year-old to keep plugging in and hope for a better result. “He [Dravid] told me to continue what I was doing, ‘do the process right and one you get in, show the hunger there. Cricket can change any day. It can change tomorrow,” Nair said.